Available for shipping to addresses in the United States, Canada, Mexico, Japan and other 110 volt countries. Maximize workout results and minimize workout time with the new Sauna Fix Hot Yoga and Exercise near infrared (NIR) tent sauna system. Endorsed by Yoga Digest, the energy efficient and eco-friendly NIR sauna lamp and radiant sauna tent included with this bundle can be used in multiple ways. The interior is spacious enough for persons up to 6' 5" (1.98 meters) in height to comfortably engage in hot yoga or other forms of exercise or to lie down and sauna. Custom radiant panel inserts quickly downsize the tent interior from an exercise sauna space into two smaller spaces ideal for maximum near infrared light exposure from either a standing or sitting position. Fully assembled, the lamp measures 13.5" (34 cm) deep, 17" (43 cm) wide, and 23" (58 cm) tall. The Sauna Fix 110 volt portable near infrared sauna lamp, custom brown colored travel/storage bag, and rope ratchets for hanging and adjusting the height of the lamp. Hot Yoga and Exercise radiant sauna tent panels, one middle tent divider partition insert, one drop-ceiling insert panel and portable storage bag. Tent frame assembly brackets, poles, and connectors with portable storage bag. Breathe Safe Sauna ION Generator. Natural Bamboo tent floor mat and (1) organic cotton bamboo throw rug. Healthy Salt (one 2 oz jar) and Baja Gold Sea Salt (1 lb). Near Infrared light eye protection glasses. The Sauna Fix NIR lamp is constructed entirely with UL listed components, and the assembled fixture meets Federal requirements. The Sauna Fix sauna lamp is also CE and RoHS certified, ultra-low EMF, and more energy efficient than far infrared sauna types. Unlike other NIR sauna lamps, the fixture is crafted with a proprietary blend of nontoxic polymers and metal that is safe to touch and the threaded uniform lamp light guards require a simple one-time assembly onto the base. What's most important is that near infrared saunas are loaded with proven health benefits, including improved detoxification through sweat. Four red heat lamp bulbs are required to operate the Sauna Fix and must be purchased separately. The radiant sauna tent included with the Hot Yoga and Exercise sauna bundle features an enlarged space is ideal for many forms of exercise. 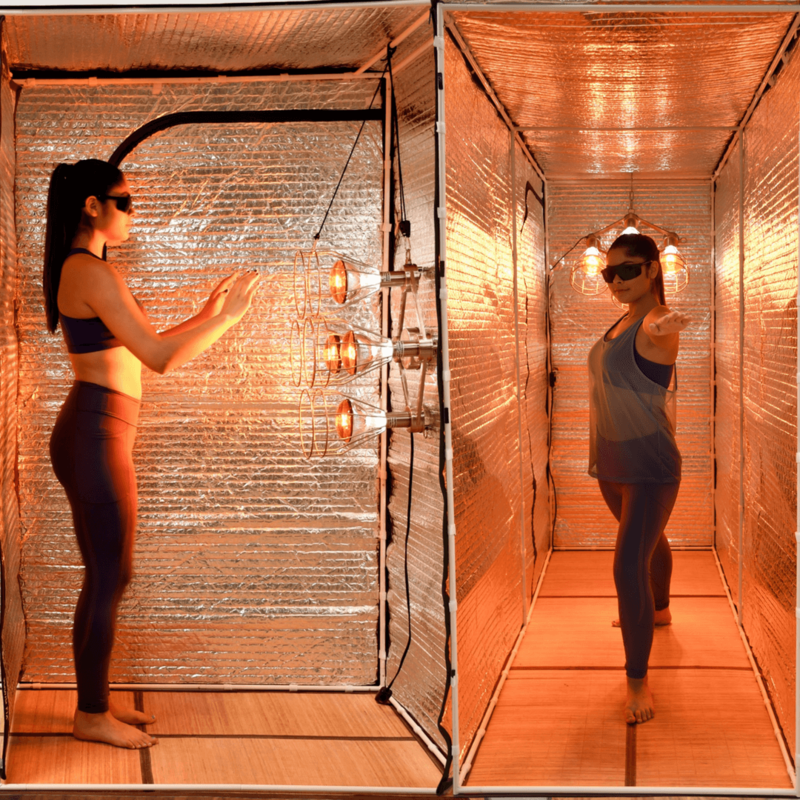 The insulating radiant material retains 95% of the Sauna Fix near infrared sauna lamp heat inside to save energy and maximize sweat, increase fat and weight loss, and deliver more health benefits than any exercise alone. The tent's radiant panels efficiently retain heat so well that no lamp preheating is required. The radiant tent panels are made from layers of nontoxic wood grain film, space blanket, large diameter bubble wrap, space blanket, and nontoxic film. This material, unlike cotton or canvas tent material, has achieved an "A" fire safety rating. This unique tent material does not outgas (produce toxic vapors) and remains nontoxic when the sauna is heated. The layer of bubble wrap is in fact, not exposed to the heat, and is sealed completely inside. It will not heat up, due to the air in the bubbles. The heat also will not be absorbed because it bounces off the reflective tent surface. The space blanket layer shields wireless signals from home electronics to minimize electromagnetic pollution. The tent panels are not porous; they are smooth. The panels will not absorb toxic humidified sweat like competitor products do. Porous materials such as canvas, wood, and other fabrics, result in the accumulation of humidified sweat and their toxins inside the sauna enclosure, and they are also reheated with every use. The tent panels can be conveniently wiped down and cleaned, and the Sauna ION Generator can be put inside to break down sweat toxins and keep the tent clean and safe. The film is is polymer, not plastic, and will not get hot (only mildly warm). The zippers are free of toxins, unlike zippers in the USA, which can have large amounts of lead. The full tent product is RoHS certified and can safely be used every day. The steel tent poles are completely powder coated in a non-toxic RoHS certified, zero VOC, white color. The sauna tent frame is sturdy, self-supporting and requires no additional tools to assemble. Learn how to assemble the tent. The Breathe Safe Sauna ION Generator supplies more than 23 million ions per cubic centimeter that boost sauna therapy benefits. Negative ions also help remove odors (like sweat) and destroy bacteria. This small but powerful plasma ion generator also boosts oxygen inside the sauna tent while using only 2 watts of power. The bamboo tent floor mat has a radiant backing with cotton canvas bound edges. The material is naturally fumigated when it is boiled and carbonized by baking under pressure with high heat. Natural bamboo emits a mild odor initially, that dissipates after a month of use. Persons with odor sensitives may prefer using the organic cotton bamboo throw rug (included with bundle) instead. To extend the life of the mat, avoid using sauna stools with pointed feet when enjoying a post-workout seated sauna session. We recommend this portable poplar sauna stool. The organic bamboo/cotton throw rug is fantastic to place over half of the mat to protect it from sauna sweat during the sauna session. The rug is made from custom mill organic bamboo/cotton fleece, and is super fluffy and thick! It does not disperse toxins into the air during the sauna, and is absorbent enough to retain the sweat's moisture. To help replenish sodium lost in sauna sweat and exercise, the Hot Yoga and Exercise sauna bundle includes Healthy Salt and Baja Gold Sea Salt. Healthy Salt is considered a miracle worker, as it supplies vast amounts of necessary minerals for the body, while also alkalizing, detoxifying, and hydrating. Take a look at the amazing effects of Healthy Salt. The addition of Baja Gold Sea Salt to your food also helps supplement the body with an array of essential trace elements and minerals that are often missing in a modern diet. Learn more about Baja Gold and what makes it so wonderful. Near infrared eye protection glasses: It is important to protect your eyes from near infrared light rays during sauna use, which is why infrared light protection glasses are included with every Sauna Fix bundle. NIR eye protection glasses do what sun glasses, tanning glasses, and even glasses rated for lasers cannot. The intense 700-1400 nm light rays emanating from the sauna lamp bulbs require appropriate eye protection. The glasses provided are rated for UV 400 protection, custom made with polycarbonate material to cover IPL 190-1800 nanometers of light, and fit comfortably over another pair of eye glasses. Be sure to purchase an extra pair of glasses if more than one person will use the sauna at the same time. As of February 14, 2019, the Sauna Fix carries a lifetime warranty. This warranty covers the sockets, electrical wiring switch, electrical cord, and any defective welds or threads or nickel finish. The customer may send in the sauna to be fixed, or request replacement parts. This warranty does not cover cross threading due to improper assembly of the light guards, nor does it cover any misuse or abuse of the unit, such as crushing, dropping, or bending parts. The sauna lamp arrives with an extra socket so that, if there is a failure, the customer has the option of avoiding shipping charges by having the socket replaced by an electrician. The radiant sauna tent carries a 3-year limited warranty. This warranty covers the workmanship, zippers, and sewing for normal use. It does not cover misuse of the tent panels and components, such as ripped zipper binding, bent tent poles or brackets, and tent fabric punctures. It does not cover scorched or melted panels caused by improper sauna lamp use, such as placing a sauna lamp in direct contact with the tent panels, or neglecting to turn off the sauna lamp when exiting the tent. The Breathe Safe has a 1-year warranty. Accidental damage, such as faulty plasma function due to dropping the machine, is not covered under warranty. Upon inspection, it will be determined if damage was caused by misuse; in which case, the customer will be charged for replacement or repair. Warranties do not include the cost of shipping to or from after 30 days. Any damages acquired during shipping must be reported as soon as possible, but in any event not later than specified in our policy. The customer must also save all the original packaging, provide pictures of the damage so a claim can be made with the shipping company, and sign a claim form. Failure to provide the required items and sign the necessary claim forms eliminates our obligation for damaged product replacement and results in a denial of the shipping insurance claim.